에딘버러에서 어학연수 하는 Baneen 과 Juhina 의 어학연수 후기. 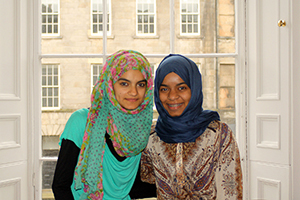 We spoke to two students in Edinburgh, Baneen, from Saudi Arabia, and Juhina, from Oman, both taking IELTS Preparation courses. This is what they had to say about their student experiences in Edinburgh. 에딘버러에서 어학연수를 하고 있는 사우디 아라비아에서 온 Baneen 과 오만에서 온 Juhina 로부터 카플란의 어학연수 이야기를 들었습니다. Baneen 과 Juhina 는 둘다 아이엘츠 시험준비 과정을 듣고 있었는데요, 그들이 듣고 있는 아이엘츠에 과정에 대해서 Baneen 과 Juhina 가 여러분께 많은 조언 하였습니다. Why did you come to Edinburgh to study English? 어떤 계기로 에딘버러에서 공부하기로 결심하였나요? Baneen: My dad found out about Kaplan through an agent. He told me to choose whether I wanted to study in the US or the UK, and I chose the UK. Here it seems like a very safe place, and the people are very friendly. It is also much closer to home than the US. I live with a host family, and they are very nice. It’s good practice to speak English with them after my lessons. Baneen : 어학연수를 준비할때 아버지가 유학원에 함께가서 영국과 미국중 어디를 가고싶은지 물어보았습니다. 그당시 영국이 더 안전할듯 싶고 사우디아라비아에서도 훨씬 가까워서 미국보다는 영국을 선택하였습니다. 그리고 와서보니 영국은 참 안전하고 사람들도 굉장히 친절하더라구요. 현재 홈스테이를 하고 있는데 굉장히 친절하여 영어 말하기 연습하는데 정말 도움이 많이 됩니다. Juhina: I went to study English abroad because of a scholarship I received. I want to go to university to study Disaster Management. I chose the UK, and my agent chose Edinburgh. I am happy to be here, the school is good – everyone is very helpful here. It is a nice city. Juhina: 저는 국가 장학금을 받게되어서 어학연수를 오게되었고, 재난관리 에 대한 공부를 하고 싶어서 영국을 선택하였습니다. 영국중에서 어디를 선택할까 하던중 유학원에서 에딘버러를 적극 추천하여 에딘버러를 오게되었습니다. 에딘버러생활에 만족하고 있고, 사람들이 굉장히 도움을 많이 주고 있어서 에딘버러에 대한 인상이 참 좋습니다. Why did you want to learn English? Baneen: I want to learn English to go to university. Baneen : 대학교에 가고 싶어서 영어를 배우고 싶습니다. Juhina: I want to study English to prepare for university, because I want to study in the UK. Juhina : 영어를 배우는 목적은 영국내 대학교 진학을 위해서 입니다. What’s the best thing about your classes? 현재 카플란 수업중 가장 좋은점은 무엇인가요? Baneen: My favorite thing is when we have activities in class. It’s very fun. We watch music and cartoons, and listen to music. My favorite songs that I learned about are from Queen, and the song “We Are Family”. When I go home, I’m going to share them with everyone, I really love them. Baneen : 제가 제일 좋아하는 부분은 액티버티 클라스 입니다. 굉장히 재밌어요. 음악도 듣고 카툰도 보는데 정말 재미있어요. 그중 제가 가장 좋아하는 노래는 퀸의 "We Are Family" 입니다. 모국에 돌아가면 이노래를 제가 아는 모든사람과 같이 듣고 싶어요! Juhina: I’m taking General English with an IELTS elective. I need to get a good score on my IELTS for university. When I came here, my English was not great. I studied German in the past, but now I wanted to learn English because it is very useful. I speak more clearly now. I need to study more vocabulary and grammar but I am getting much better. Juhina: 저는 일반영어를 듣고 엘렉티브 코스(보충숭업) IELTS 를 듣고 있어요. 제가 영국에 처음 왔을때 영어실력이 별로 좋지 않았어요. 전 이전에 독일에서 공부를 하였는데 영어가 전세계 공용어만큼 많이 쓰이니 영어를 꼭 공부하고 싶었어요. 지금은 영어로 의사소통이 조금 수월해졌지만, 아직도 단어와 문법 공부를 더해야되요. 하지만 현재 예전보다 훨씬 영어 실력이 늘었어요~! What is the most exciting thing you’ve done since you’ve been in Edinburgh? 에딘버러에 와서 가장 흥미로웠던 경험을 말해주세요. Baneen: It’s a beautiful city – there’s a very nice lake nearby, and I like visiting. I also really like the Edinburgh Zoo, there are lots of interesting animals there. Baneen: 에딘버러는 참 아름다운 도시예요. - 제가 자주 가는 호수도 근처에 있고.. 제일 좋아하는 점은 에딘버러 동물원이예요. 동물원에 다양한 동물들이 많아서 저는 에딘버러 동물원을 참 좋아합니다. Juhina: I really like Edinburgh Castle – it’s beautiful. I like researching all the places to go. There are so many things to see and do! Juhina: 저는 에딘버러 성을 정말 좋아해요. - 일단 아름답고, 볼것도 많고 할것도 많아요! 영어실력은 많이 늘었나요? 어떤 부분이 많이 늘었나요? 스피킹? 리스닝? Baneen: When I came here, my English was zero. Now, it’s much better. I can communicate with people in the school and around Edinburgh. For me, writing is the toughest. Baneen: 에딘버러에 처음왔을때 정말 영어에 대해서 하나도 몰랐어요. 제로 였다고 말할수 있어요. 지금은 훨씬 낳아졌죠. 지금은 최소한 학교 사람들과 에딘버러안에서 의사소통이 가능하니깐요. 저한테는 롸이팅이 가장 큰 숙제였어요. Juhina: Everything has improved. When I started taking the practice IELTS, I felt uncomfortable, especially with the speaking section. But as it goes on, I feel much more comfortable. My writing has also gotten much better. Juhina: 다 고루고루 늘었어요. 처음에 아이엘츠 모의고사를 보았을때, 자신없었는데.. 특히 스피킹이 가장 자신이 없었어요. 하지만 시간이 지날수록 좋아지고있어요. 롸이팅도 늘고 있구요. What is your plan after you finish your course? 어학연수 끝나고 향후계획이 어떻게 되는지요? Baneen: I want to go to university to become a physical therapist. Baneen: 저는 대학교에 가서 물리치료사가 되고 싶어요. Juhina: I want to study in Coventry, I need the IELTS course to get a good score so I can get into the university. What do you like about Kaplan, and Edinburgh? 카플란의 어떤 점이 좋나요? 그리고, 에딘버러의 어떤 점이 좋나요? Baneen: Here at Kaplan Edinburgh, everyone is very friendly. If you need help, you can just ask and someone will help you. Even when you want to book a holiday, they will help you organize everything. It is very welcoming. Baneen : 에딘버러사람들은 굉장히 친절해요. 도움이 필요하면, 아무에게나 도움을 청하면 모두들 친절하게 도와줍니다. 여행을 계획하는데 도움이 필요해서 물어보면 필요한 모든 정보를 다 정리해줄정도로 사람들이 참 친절해요! Juhina: First, I thought everything was very difficult, when I got here. But now, I know everything. I help myself. I feel much more independent now. I take the bus everywhere and I can find out where to go without any help. I feel very confident. Juhina: 처음에 왔었을때는 모든게 매우 어렵고 처음이었어요. 하지만 지금은 이곳에 대해서 잘알고 있어요. 지금은 훨씬 독립적이지요..:) 버스를 탈때도 도움없이 혼자 다 해결해버릇해서 자신감이 생겼어요. If you’re a Kaplan student, and you want to share your experiences, let us know in a comment or on our facebook page! We would love to talk to you.